Job opportunities for LPNs are set to grow steadily across the country – and Michigan is no exception. Between 2012 and 2022, Michigan’s Bureau of Labor Market Information and Strategic Initiatives predicts nearly 2,800 LPN job openings will be created, a 15 percent uptick. Students graduating from one of the state’s many LPN schools can pursue employment in patient-care settings ranging from hospitals to nursing homes. During the research process, prospective students should ensure programs not only fit their financial and academic needs, but are also approved by the Michigan Board of Nursing. Scroll down to begin the school search process, see a collection of the top LPN schools in Michigan, view LPN salaries by metro area, and learn about the state’s nursing licensure process. With available programs at community colleges, universities, and technical schools, Michigan offers many education pathways to an LPN career. The search tool below allows prospective students to compare schools side-by-side to locate a program that best matches their preferences. 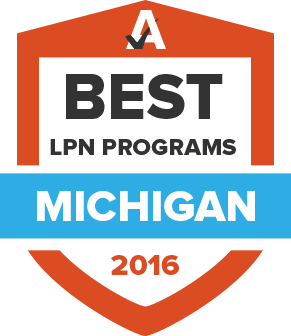 LPNs in Michigan are on the forefront of patient care in a variety of healthcare settings. With so much responsibility resting on their shoulders, the state has a number of mandates in place before prospective practical nurses can receive full licensure. Keep reading to learn about the various necessary steps. As part of their state-approved LPN certificate program, students must complete a variety of classroom coursework and hands-on training. Once they graduate and are ready to become licensed, candidates must have their alma mater send official transcripts along with a Michigan Nursing School Certification form to validate their certification. When graduates are ready to take the NCLEX-PN, the Board of Nursing requires them to contact a Pearson Vue testing center to register. The Board will then send an Authorization to Test notification, at which point candidates have 90 days to undertake the examination. At the time of their application, students must also pay a $54 registration fee. Once a student successfully passes the NCLEX-PN, they receive their license within three weeks. Recently licensed practical nurses must renew their license after one year, with all others requiring renewal every two years. Professionals are notified of their renewal date approximately 45-60 days before expiry. When requesting a renewal, LPNs must show proof of continuing education credits earned during the interim period and pay a $74 renewal fee. Licenses may be renewed online, via mail, or in person at the Board of Nursing. Whether just starting out or an experienced professional, LPNs in Michigan garner respectable salaries. The mean annual wage sits at $44, 310, on par with the average for all occupations across the state. Aside from experience, another significant factor for salaries is location. LPNs who elect to work in populated metropolitan areas can expect to make a higher wage than their counterparts in rural areas. Use the tables below to find out more about earning potential. Michigan LPN jobs are expected to rise by the thousands in coming years. Still, some areas may experience higher levels of growth – especially more urban regions. The tables below provide concrete data about projected new positions in various parts of the state in the next few years. First-time LPN certificates can use this online form to apply for licensure after they’ve completed an approved LPN program and successfully passed the NCLEX-PN examination. LARA is the state department that handles all the licensing regulations for Michigan. Their official website offers valuable insight into the process of becoming an LPN. This helpful summary of LPN roles in Michigan provided by the Department of Licensing and Regulatory Affairs offers a comprehensive look at licensed practical nursing roles throughout the state. HOSA-MI provides aspiring and current nursing students in Michigan with valuable resources, including information about licensure and job boards to land their first position after completing an LPN certificate and becoming licensed. Students and recent graduates looking to learn more about the healthcare landscape in Michigan can find many resources and research articles on the MDHHS website, as well as a list of current jobs throughout the state. This government agency exists to provide helpful information and resources related to the healthcare workforce in Michigan. The center has a bevy of relevant research and data about nursing professions in the state along with a listing of job opportunities. MLPNA is a professional organization dedicated to serving the needs and interests of LPNs throughout the state of Michigan. Aside from regularly gatherings, the association also provides continuing education, advocacy efforts, relevant news, and regularly updated resource lists. As a member-based professional organization, MINU keeps its constituents up-to-date on the latest industry news and trends, legislation affecting the occupation, and upcoming events. Members can also sign up for an e-newsletter with job postings. The Michigan state government provides a scholarship for eligible residents attending an educational nursing program, including students looking to complete an LPN certificate. The MBON provides a comprehensive list of all the schools within the state offering LPN certificates that meet the requirements of the Board. The list also includes contact information for each institution.